patches round cats animals glow in the dark pets, iron-on patches, Flickli - special reinforced fabric patches perfect suitable as knee patches! 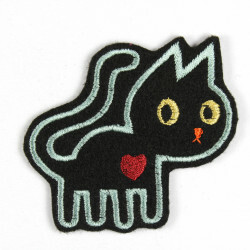 This cool kids iron-on patches around with glow in the dark kitten is deposited with a high quality ironing film. So, mounting this patch is not a problem! 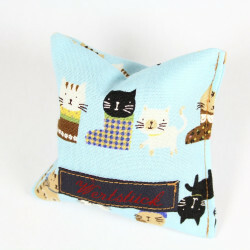 The pants patch with cats is additionally reinforced tear resistant and also ideal as a knee patches. The animal patches are supplied in a package with a detailed ironing instructions. 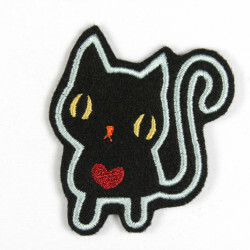 This iron-on patches is really a must have for a kitten fan! Each round iron-on patches Flickli with gitd cats is because of the pattern variance unique! Through the color combination of white and black colors you can also repair high qualitiy clothes easy and unobtrusive. Have fun using these glow in the dark iron-on patches! 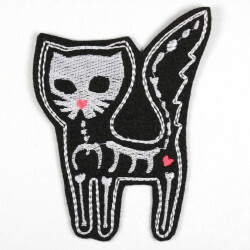 In the shop you can find much more patches with the animal motive! Have a look! 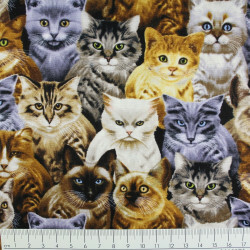 Of course you can find a lot of individual applique´s with cats and kitten. Size: The round patches with a diameter of about 9.5 cm. The offer is for a round knee patches with glow in the dark cats (Fig. 1). Figure 2 show the possible pattern variance.